Aberdeen drew 1-1 with Rangers on the opening day of the season. Bruce Anderson enjoyed a debut to remember and saved Derek McInnes’ Aberdeen from 90 minutes to forget. This was a great chance for Aberdeen to send out a statement on the opening weekend of the Premiership season. Instead it was Steven Gerrard’s Rangers – forced to play 78 minutes with only 10 men – who signalled that they mean business. 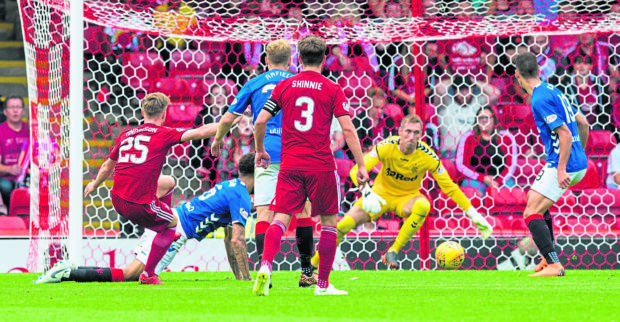 Gers forward Alfredo Morelos was sent off for needlessly kicking Scott McKenna with only 12 minutes gone but the Dons struggled to make the most of their one-man advantage and they fell behind when James Tavernier netted from the penalty spot with half an hour gone. Gerrard’s men looked set to depart Pittodrie with all three points and a morale-boosting start to the campaign until 19-year-old Anderson, who spent time on loan at Elgin City last term, rescued a point in injury time with Aberdeen’s first shot on target. The impact of Thursday’s 120 minutes against Burnley in the Europa League was clear to see but this was a disappointing showing from the Dons and McInnes will have been relieved to take something. Aberdeen failed to win any of their four meetings against Rangers last season – losing on three occasions – but still finished three points ahead of their Ibrox rivals to secure a fourth successive runners-up spot. The expectation is it will be even tougher for the Dons to finish in the top two this time around – and, on yesterday’s evidence, that seems the case. McInnes was forced to make two alterations from the side that started at Turf Moor with Dominic Ball and Stephen Gleeson drafted in for the suspended Shay Logan and the injured Tommie Hoban. The game kicked off following a minute’s applause for Gothenburg Great Neale Cooper, who played for both clubs, and it was the visitors who threatened first. The Dons defence was caught out with a long ball over the top but Joe Lewis was quick off his line to thwart Murphy. The red card for Morelos after 12 minutes for a petulant swipe at McKenna looked likely to tip the game in Aberdeen’s favour but it was the visitors who had the chance to take the lead with half an hour gone when Ball was penalised for a foul inside a packed penalty area on Josh Windass. Lewis guessed correctly but was unable to keep out Tavernier’s spot kick. To make matters worse for the Dons, McKenna suffered a hamstring injury in the build-up to the penalty award and was replaced by Chris Forrester. The Dons fans made their frustrations known when the half-time whistle sounded. Much better was required after the break but the visitors continued to look the more likely with Windass nodding over from a Lassana Coulibaly cross. The Dons, slowly, began to up the ante with Devlin nodding over from a Gary Mackay-Steven corner before Anderson replaced Cosgrove. The youngster had a chance to make an immediate impact but he nodded wide from Ball’s delivery. But he was not to be denied in injury time when he pounced on an Andrew Considine knockdown and arrowed a low shot into the bottom corner. It was barely deserved but the Dons support did not care. ABERDEEN (4-2-3-1) – Lewis 6, Considine 6, McKenna 5 (Forrester 31), Devlin 6, Gleeson 5 (May 52), Shinnie 6, Ferguson 6, Ball 6, McGinn 6, Mackay-Steven 6, Cosgrove 5 (Anderson 71). Subs not used: Cerny, Wright, Campbell, Harrington. RANGERS (4-3-3) – McGregor 6, Tavernier 7, Goldson 6, Murphy 6 (Kent 70), Jack 7 (Ejaria 82), Windass 6, Flanagan 6, Katic 6, Morelos 3, Coulibaly 7, Arfield 6. Subs not used: Alnwick, Sadiq, Halliday, McCrorie, Candeias.